I had a fellow farmer go with me to check out the Ford 555 backhoe, his first question was "why haven't you bought it yet moron? ", so i said what the heck, the owner of it wants it gone so we settled on $700 for the backhoe, 3 extra buckets, and a pair of forks for the front bucket. Yeah i know i over paid for it! LOL ) We tried to get it to start and run, i'm pretty sure the fuel filter needs to be changed, the machine has set 6-8 years and not been started, but it will turn over. Where is the serial # at on it?? Some parts have a year breakdown and i have no clue what year it was made. Last question, should i use the Ambra 134 hydraulic oil from New Holland or would 90 wt oil be ok? Sounds like a good deal. Assuming this one has a cab ? Serial number tag might be affixed inside it in plain view. If no cab, I am not sure. What series ? I have a 555C, still not all that familiar with everything on it yet and still need to get the books on it. I would be very careful with the fluids, easy mistake to put the wrong kind in there. I don't think you want to use 90 wt anywhere on this tractor. Certainly not in the rear end, it has the very common double reduction planetary type in it. It has the torque converter transmission and oil supplies to the hoe and loader, none of those components will tolerate 90 wt oil. Get the books and or speak with the NH dealer if they know the older Ford machines. My dealer is very good on the older tractors, I had this machine through theirs shop for a full service. If this tractor should run and only fuel issues, you have made a very nice deal, don't screw it up by making a rookie mistake and using the wrong oil. Let us know how it goes, best of luck with it and hopefully you'll get it running again. If it has not run for awhile there may be some stuck internal injection pump parts too, happens to both inline and rotary pumps. Just repaired a 575D pump for a neighbor last week. 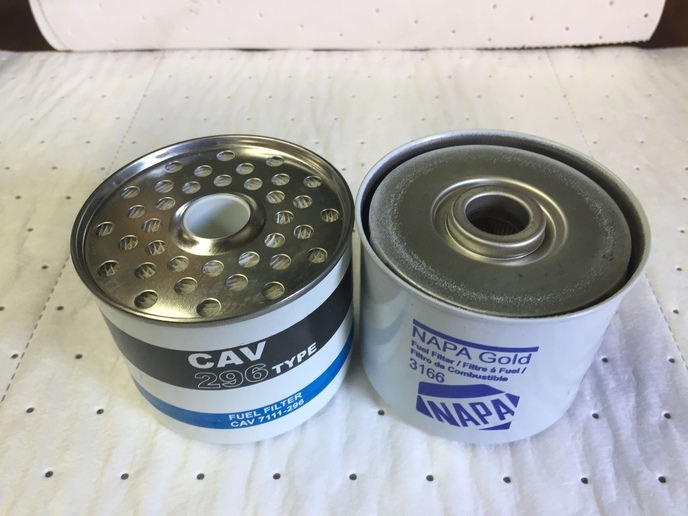 Also be aware of the fuel filter installation, if it has NAPA/WIX filters make sure the filter top outer fuel inlet groove does NOT have an O ring placed in it by mistake as it will restrict/shut off fuel flow into the filter. No it has no cab, just ROPS. It is a plain 555 backhoe, i'll check with the dealer when i go to get a fuel filter, i'm sure the 134 Ambra fluid is what it takes, i'm going back with new holland stuff, esp filters and oil. i see your e-mail is open, i can send you photos of it if you would like. The machine is 30+ miles from me so its aggravating to tinker with it that far, be easier once i get it home. Ambra 134 and or equivalent of same specification should be just fine. Sure sounds like a good deal, be great to see the photos. Hopefully you can get it out of there and home soon, no time like the present once bought. This one I have was a seemingly good find, very low hours, and so far so good with the work I have done so far. Hoe is very strong on these. I've run just about every brand and most models when I was a full time operator, really not impartial to any particular brand or model, do like my Ford's but this type of machine is about the handiest thing one can own no matter what make and model. My 655A has four places where I put in hyd/trans fluid. Torque converter. Rear end. Hyd tank in front of the radiator, and power steering. There's a spin on filter up underneath for the torque converter. A big one on the right side of the loader frame for the hyd. system. And one in the power steering reservoir. My in line injector pump has its own oil reservoir, but I don't think they used that pump on the three cylinder engine. Foil sticker on LH or RH on shroud rite behind fuel tank. Been to long mite be on under side of cover for radiator cap.